In April 1865, Dorchester's Town Meeting gathered to consider an important civic measure - "to procure…a Corporate Seal of the town." 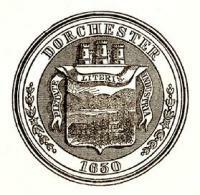 Many modern residents of Dorchester are familiar with that seal, emblazoned with the words "Dorchester 1630" and the Latin motto "Pietate, Literis, Industria," but some may not realize the depth of thought that the men at that 1865 town meeting put into the enduring and proud symbol. A range of political, historic, and civic considerations compelled Dorchester's leaders to seek a seal testifying to the town's unique history and sense of place in Massachusetts. With the Civil War coming to its savage end and with so many Dorchester families having lost fathers, sons, and brothers on the conflict's far-flung battlefields, local leaders wanted to extol the town's more than 250 years of contribution and sacrifice. They sought to create a symbol of Dorchester's unique place in the nation's history: "The town of Dorchester…the mother of free public schools, whose patriotism and liberality have been so tried in the early wars with the Indians, with the French in colonial days, in the War of the Revolution, in the Shay's Rebellion, in the last war with England, and in the dreadful war so lately gloriously closed." A town seal, in the opinion of people from Neponset to Savin Hill, would help to "sacredly preserve the beautiful tribute of her citizens to the memory of sons, who, in obedience to early instructions, and inherited purpose in morality, patriotism, and humanity, have laid down their lives on the altar of their country." Along with patriotism, a large band of Dorchester's residents hoped a local seal would reinforce their status as an individual town, for in 1865, the prospect of annexation by Boston was on the horizon. Many locals already lamented that in 1804, "that part of Dorchester's territory lying upon her northern border…including Dorchester Heights," had been appropriated by Boston. In the 1850s, Dorchester leaders had vainly struggled as "Washington Village was swallowed up by the city [Boston]." With many residents still hoping to fend off further incursions by Boston, a who's who of prominent Dorchester men - Edmund J. Baker, Edmund P. Tileston, Nathan W. Tileston, and others - formed a committee to design a town seal in April 1865. Joining the effort was Dorchester's Antiquarian and Historical Society. The contingent described their purpose: "Your Committee have sought to emblazon upon the Town Seal such a device as would symbolize the acts which rendered the early settlers of this town a peculiar [particular] people, and objects of gratitude and veneration by their descendants for all time to come." The centerpiece of the committee's design was a shield embossed near its base with the image of a rough-hewn, thatch-roofed church, without a chimney. In explanation of the church's significance in Dorchester's annals, the committeemen noted: "The early settlers of Dorchester organized themselves as a church at the New Hospital in Plymouth, England, in March of 1630, prior to their embarkation for this country, which act was pre-eminently the cornerstone of the foundation of this town, although they did not arrive here until early in June of that year." To the rear of the seal's church, another rude, thatched structure appeared on the shield. The second structure represented Dorchester's first school. "The free school," Edmund Baker and his colleagues asserted, "the system of which has been exerting a beneficial influence over the whole country, was established in this town in 1639, and is said to be the very first free school in the world. The foundation of this institution is recognized on the shield…"
In another image engraved upon the shield, the committee cited the portrait of a "rude mill, with its large wheel, which is seen upon the left bank of the Neponset River, the course of which river, from its source to its mouth, lay through the ancient territory of Dorchester." The image symbolized Israel Stoughton's corn mill, which he built in 1633 "by grant of land and timber by the town…and is said to be the first water-mill in the colony, if not the country." Readers scrutinizing the impressive background of the shield will likely identify the scene's inspiration - the Blue Hills. The 1865 committee, testifying to those slopes' importance to the town's early development, asserted: "In the background will be recognized the Blue Hills, which served as a landmark to pilot the early settlers to the mouth of [the] Charles River, and from behind which the rising son is shining upon a colony who left their homes in the mother country, not as adventurers in search of gold, as exiles, or for conquest, but the more precious boon of religious liberty." A regal image materialized atop the shield, soaring above the rolling contours of the Blue Hills. A castle with three imposing turrets crowned the slopes, the mill, the school, and the church. Baker and company proudly summed up their castle as a fitting symbol for the town: "The triple-towered castle surmounting the shield is adopted in respectful memory of Dorchester in Old England, of whose seal this is the principal charge (in commemoration of that borough having been formerly a Roman fortress), and from which place the infant colony derived much of its strength, both physically and spiritually." The "Roman connection" would take on added suitability several decades later, when ancient Roman paving stones would be placed at Dorchester High School. A banner draped beneath the castle and along the top and sides of the shield bore the motto "Pietate, Literis, Industria." For the committemen and their neighbors, the trio of words represented a direct link between the early settlers and the residents of 1865, words reflecting values passed down through the centuries. "The motto upon the ribbon, Pietate, Literis, Industria, signifies that piety, learning, and industry were the prominent virtues which the early settlers coveted, and which their descendants unanimously accord to them." In the case of Dorchester's town seal, the old adage that a picture is worth a thousand words might well be revised: the seal's carefully chosen symbols are worth a thousand words - plus three more that speak volumes: piety, learning and industry. Journalist Peter F. Stevens is the author of The Rogue's March: John Riley and the St. Patrick's Battalion, 1846-48, Brassey's, and Notorious and Notable New Englanders, Down East Books.